This entry covers Thursday of Spring Scream 2008 weekend (April 3, 2008). I visited Kenting during the Spring Scream 2008 (Double Rat), an outdoor music and arts festival held at the southernmost point of the island of Taiwan. I wanted to write a how-to for people who couldn’t read Chinese fluently, because it has been a real adventure to find the right information to get to Kenting. I entered Taiwan through Taipei, on a Cathay Pacific flight from Hong Kong. 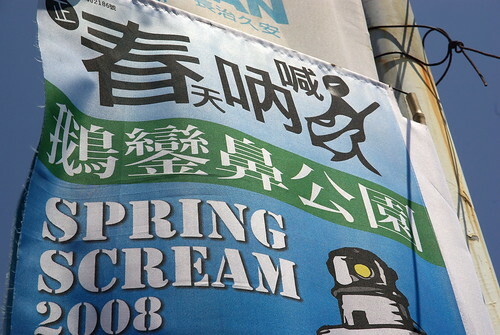 Spring Scream was on the Ching Ming (tomb-dusting) long weekend, and there was a fare war between companies that served HKG-TPE, namely HK-based Cathay (and affiliate Dragonair), and Taiwan-based EVA and China Airlines. So, I paid something like 1500HKD, after taxes and fees. Upon arrival at Taoyuan International Airport (formerly CKS Airport), I got myself a phone card from Chunghwa (their biggest phone company / former monopoly, I guess) for around 10CAD. I would have enough for five other days, occasionally making overseas calls as well. The service is called Ideal Card / Emome. 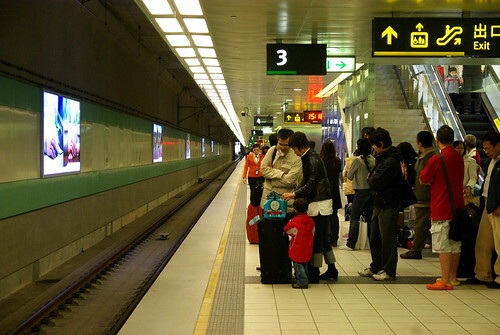 From the airport, I took a shuttle bus (prepare some change, it’s less than 100NT) to the new high-speed train station a few kilometers away, part of a brand new high-speed railw line that goes from Taipei to the outskirts of Kaohsiung, at Zuoying (it’s 5 or 6 subway stops from central Kaohsiung). The tickets, I bought them online quite easily off the Taiwan High-Speed Rail website, with a regular credit card and a passport number (needed for retrieval, but they won’t check the passport). I just went to one of the machines near the entrance of the Taoyuan station and followed the instructions to get all the tickets that I bought online. The only restriction is that you can only buy tickets two weeks in advance, whether online or by phone. So, given that Spring Scream is during a long weekend, and that people from big cities may be returning by flocks to their hometowns (or head somewhere else to relax), it is a good idea to watch the calendar. They kept making announcements that all tickets were sold on that given day (a Thursday), while the trains don’t seem to run full on regular days (the Monday on the way back). 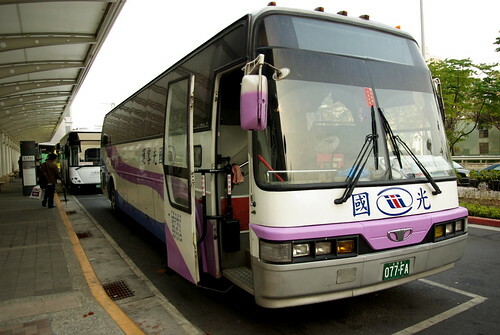 Arrived at Zuoying, there’s the tricky part… You may either take the 88 Bus, like I was planning to, or find people to taxi all the way to Kenting (or let the taxi driver find you). If you don’t speak the local language, you may always try looking around for other people who might be foreigners. The taxi is slightly more expensive (400NT vs 300NT), but a lot quicker (I think it took an hour and a half, versus two or three hours by bus). I expected the provincial road to Kenting to be clogged up like there was no tomorrow, but it ended up not so bad. Traffic was fluid, and our driver was pretty aggressive. For my tickets, I ordered mine online using Spring Scream’s preferred means, which is tickets.books.com.tw, an Amazon-like website. I had my ticket delivered to my hostel, Duggar Hawaii, run by Duggar, an American from Hawaii, living in Taiwan for more than a decade. It was a pretty unsafe thing to do, because the delivery person needs to deliver it to a person, and if noone’s there, then it’s too bad! My ticket was hopefully delivered to a neighbour, who happened to have spoken with Duggar, who handed it to him after several days of worrying half-a-world away (it was around 1400NT or roughly 45CAD for the three-day pass). 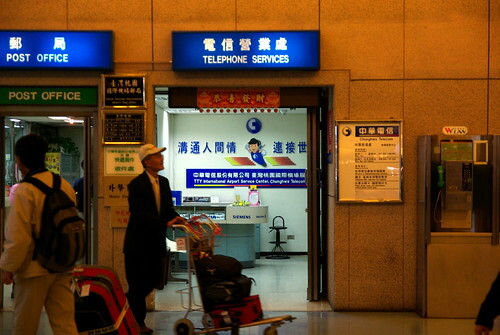 It is easier to arrange for pickup at HotKT, a local tourist agency. I also bought a ticket for Spring Wave, and had it delivered at HotKT, some 3-4km backwards from the road to Kenting, close to Hengchun, the neighbouring town. You show your passport, and that’s it. 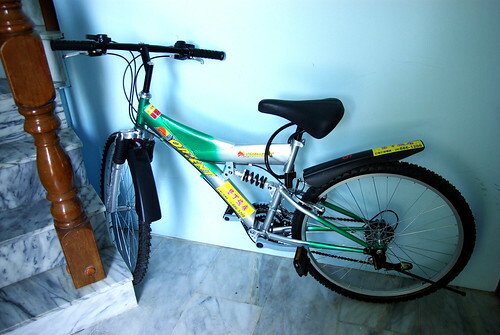 For transportation, because Spring Scream is maybe 6-8km from the Kenting main town (“Da Wan” or Large Bay), I rented a bike for 300NT a day, from the backyard neighbours of Duggar Hawaii (another inn in the back alley). They were nice enough to not charge me extra when I broke a pedal (twice). It is by far the cheapest means of transportation, and even the quickest given the impossible traffic jams that infect Kenting during the weekend (especially on Saturday night). It beats even the scooter when you arrive “downtown”. Alright, this is it for the first part of this how-to. 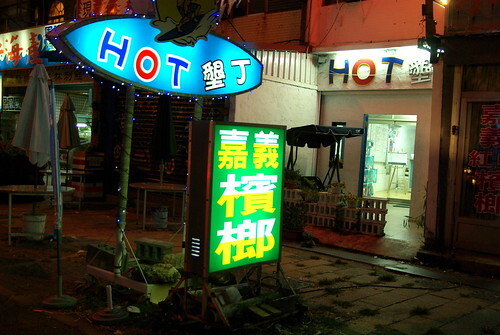 I will write the second part on what it is to get around the Kenting area, and how it is to eat and find lodging! Hey Ron! Thanks – if I could, I’d go to Kenting every year! It was fun reading your article. 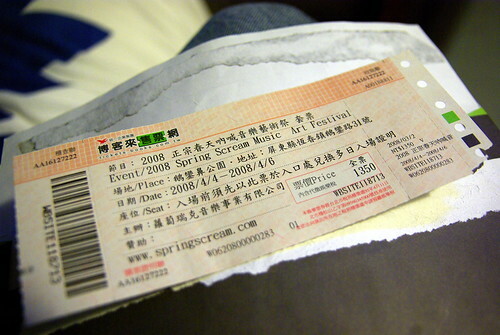 I lived in taiwan from 1991 until 2005 and my band Cultus Cod played at the first Spring Scream. Though I have never been to another, I see it has become quite an event. The first one was an event for me because I played and sang, but it was nothing compared to the mega event it has become. Love kenting, love Taiwan, and I miss it.